"U.S. Nuclear Non-Proliferation Policy: India, Pakistan, and Beyond"
first come first served, seating is limited. Pervez Amirali Hoodbhoy is Professor of Physics at Quaid-e-Azam University, Islamabad where has taught for over 32 years. He holds a Ph.D in nuclear physics from the Massachusetts Institute of Technology and is the recipient of the Abdus Salam Prize for Mathematics, the Baker Award for Electronics, Faiz Ahmad Faiz Prize for contributions to education in Pakistan, and the UNESCO Kalinga Prize for the popularization of science. He is visiting professor at MIT, Carnegie Mellon University, the University of Maryland, Stanford Linear Accelerator, and often lectures at US and European universities and research laboratories. Dr Hoodbhoy is involved in social issues as well, such as women's rights, environment, education, and nuclear disarmament. He is the author of "Islam and Science: Religious Orthodoxy and the Battle for Rationality", now in five languages. He is chairman of Mashal Books, a non-profit organization based in Lahore that publishes books in Urdu on social, philosophical, and scientific issues. 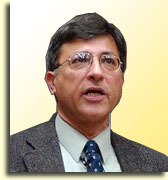 In 2003, Dr. Hoodbhoy was invited to the Pugwash Council, and he is a sponsor of The Bulletin of the Atomic Scientists. He is frequently invited to comment on nuclear and political matters in Pakistani and international media. In addition to the Margolis Lecture, Dr. Hoodbhoy will show his documentary film, "Crossing the Lines: Kashmir, Pakistan, India," on THURSDAY, MAY 11, at 5pm in SSPA 1100. Please click here for more information.